Question: Help! I just forgot my Windows 7 password and I do not know how to hack it. Do anyone know that? Do I have to re-install my system? I don’t want to take it to the repair shop because it is expensive. Any solutions here? Thanks in advance. Answer 1: Don’t worry about that. You can break Windows 7 password with the safe mode. 1. When laptop starts, please press “F8″ key. 2. At the “Advanced Boot Options” windows, choose “Safe Mode with Command Prompt” and then login Safe Mode with available administrator account. 3. Input “net user”, press “Enter” key and then all the accounts will be listed. 4. Input “net user Lisa 012″ (Lisa is the forgotten account name and the 012 is Lisa’s related account password. ), press “Enter” key to finish how to reset laptop Vista password. 5. Input “shutdown -r” and press “Enter” to restart laptop, then we can login “Lisa” account again. Then until now you have finished the steps of how to reset laptop password successfully. Answer 2: Windows 7 adopted a new password protection system that we can’t use the hidden administrator account by default. The problem is that when Windows 7 administrator password lost, we can hack Windows 7 password by using the hidden administrator account. 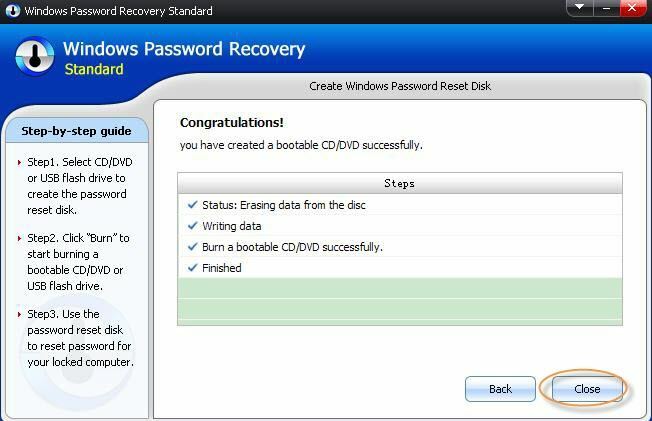 Step 1: Download Windows Password Recovery and install it on another computer which has a CD/DVD writer. Step 2: Run the software and burn the ISO image file into a blank CD/DVD. 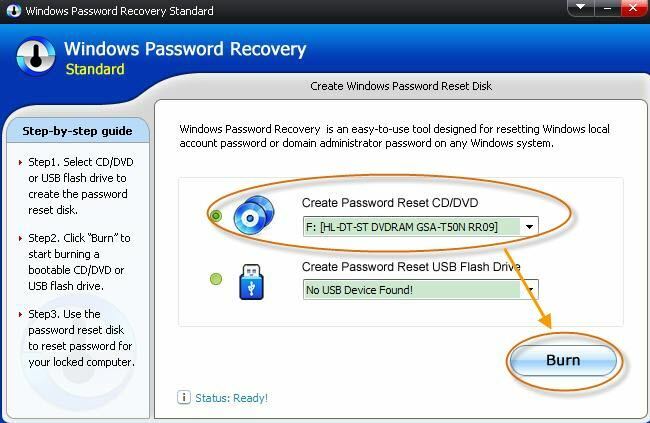 Step 3: Bypass Windows 7 password of administraor with nearly burned password recovery disk. Step 4: Reboot your locked computer without a password required. This entry was posted in Windows 7 password reset and tagged break windows 7 password, bypass windows 7 password, hack windows 7 password on December 25, 2012 by James. What is the easiest method to unlock Windows 7 password once you didn’t remember account password? Starting your password pertaining to Windows 7 might be rather fundamental, nevertheless disregarding Windows 7 account password will probably be betraying as well as create for you tons concerning complications. Listed here are several sealing off Windows 7 security password Christmas cookies relating to overcoming undetected and even forgotten Windows 7 security password concerns? Ophcrack is a no cost Windows personal password unlocker by which cracks Windows several consideration information with the use of Ultimo-amount marketing and advertising hashes through range websites. This is an excellent prosperous set up regarding array brokers determined from the brains of the approach. This specific takes in near employing a Graphical User Interface and also runs in many websites. A person that security passwords larger just fourteen characteristics not able to turn out to be damaged. 2. Melt away the actual ISO file in a Disc. 3. Squeeze true Compact Disk in to the pc in addition to reactivate laptop attached. 4. In the event the laptop or computer begins you need to click on the proper key to sink into the specific start menus, Windows 7 crucial. Usually, F10 or even Take away, windows several crucial. 5. When within the begin foods variety select the vacation the Disc is within. Right this moment go through onscreen suggestions. Pursuing showing up for the click on the selection concerning“crack”to get rid of the particular security password linked to Windows Seven. Should you are not necessarily effective in laptop or computer; it is not in condition to be able to hack Windows 7 password party cracker. SmartKey Windows Password Recovery Professional will be the majority republican company Windows private password totally reset software. The concept sanctions one to melt away a fresh bootable password reset CD/DVD/USB exhibit motorist in order to remodel overlooked Windows go along with various other person company accounts report within Windows 7 beneath DOS. In comparison with some other suitable syndication, wonder visitors leveling boot is actually advanced inside of match ups as well as stability utilizing a whole lot worse good quality. It might split Windows 7 security password more rapidly compared to many other Windows security password cookies without any problems with your personal computer details and also designs and its particular pass word restoration rates tend to be a 100% certain. 1. Down load and install SmartKey Windows Password Recovery Professional. 3. Begin your own personal computer or make up the Disc for each CD/DVD/USB. 4. Get rid of the password via Windows 7 beneath DOS. This entry was posted in Windows 7 password reset and tagged crack windows 7 password, hack windows 7 password, unlock windows 7 password on December 21, 2012 by James. “There are two computers in my home. My father has a Toshiba laptop and I have a Dell desktop. Both of our computer running with Windows 7 operating system. We have used our computer for about two years. We all set up passwords for personal privacy. Sometimes we may meet such problems in our life. Computer is so popular and we are inevitable to lost our passwords. So what can we do after such problems happened? Can we just leave it alone? The answer is no. For several reasons I have learned many knowledge about computers. Now I am a computer fan and I think the following tips about Toshiba password reset may be helpful for you. This is the most comman methods for the people who hava little knowledge about computers. You may think that this is the most direct and convenient way. However, the fact is this is the troublesome and dangerous method. Beacuse after re-installing the system you may lose your data in your computer, and it may take time for you to do it. What’s more, you may have to borrow or even buy a system disk. And the fact is not every persons have a disk for their computers. There’s a way to reset the password and it doesn’t involve reformatting and reinstalling Windows. The solution is called Ainorsoft Windows Password Recovery from http://www.windowspasswordrecovery.net. It can reset almost all Windows passwords in seconds. If you want to know how to use it, please visit it windowspasswordrecovery.net. Take Windows 7 for an example. You can follow these 4 steps with less than 5 minutes. During this Christmas time you can enjoy the lower price than usual. 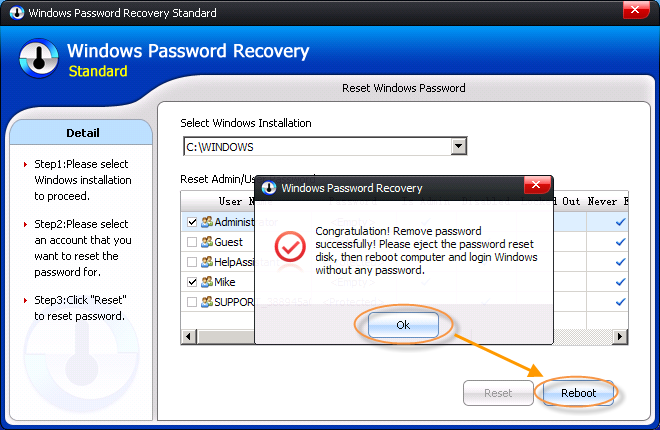 Don’t hesitate to use Ainorsoft Windows Password Recovery (download link)to recover lost Windows password when you lost it. We wish you a Merry Christmas! As a matter of fact, such tips also suitable for Dell password reset problems. 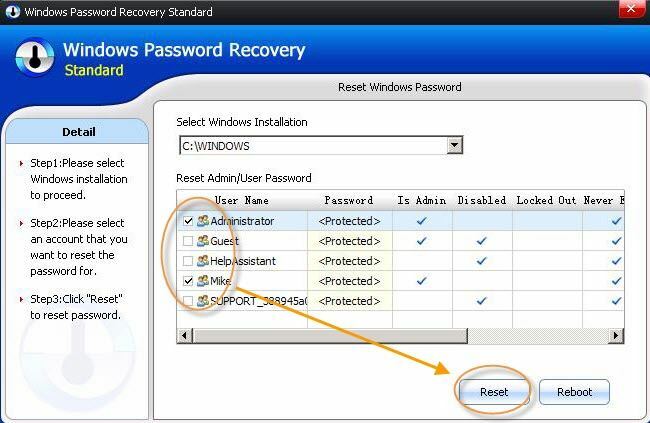 You may refer it and choose your best answer to rescue your lost Windows password. Good luck. This entry was posted in Windows password reset and tagged Dell password reset, hack windows 7 password, lost windows password, toshiba password reset, windows password reset on December 13, 2012 by James. I Can’t Remember Acer Windows 7 Password, How to Reset? How to Bypass Windows 7 Password on HP Laptop? How to Change Windows 7 Admin Password?